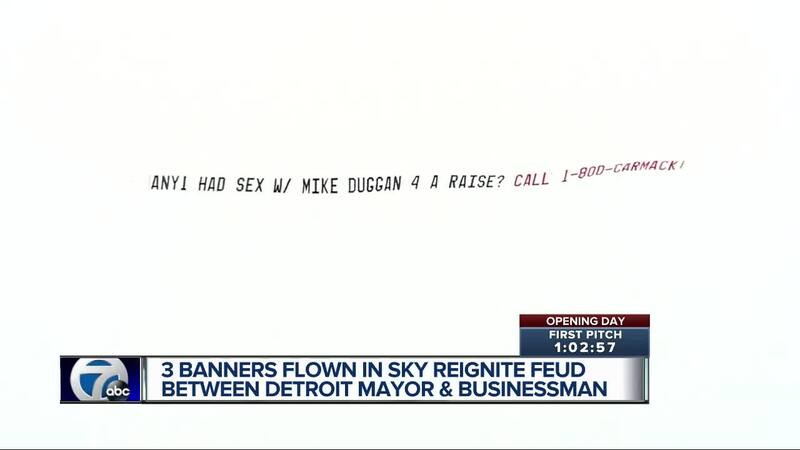 The big crowd in downtown Detroit for Opening Day saw a high-stakes game in the sky as the ongoing feud between Detroit businessman Bob Carmack and Detroit Mayor Mike Duggan reached new heights. Carmack paid thousands of dollars to fly three banners over Comerica Park and downtown Detroit for several hours that made disparaging and unsupported claims about the mayor. 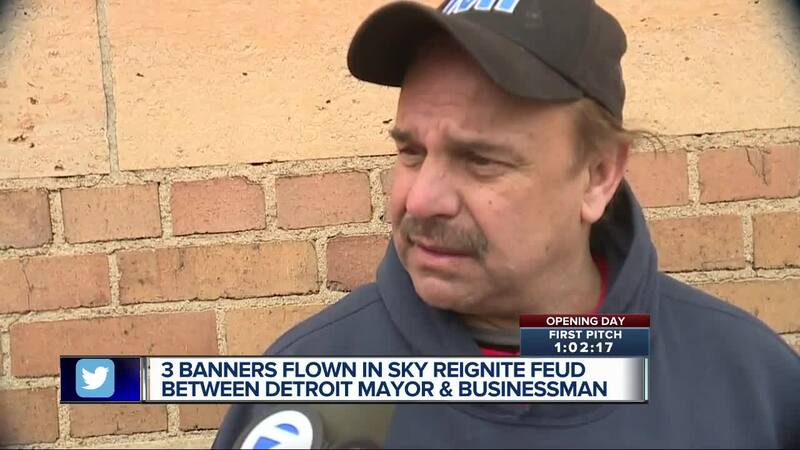 DETROIT (WXYZ) — The big crowd in downtown Detroit for Opening Day saw a high-stakes game in the sky as the ongoing feud between Detroit businessman Bob Carmack and Detroit Mayor Mike Duggan reached new heights. Carmack paid thousands of dollars to fly three banners over Comerica Park and downtown Detroit for several hours that made disparaging and unsupported claims about the mayor. The three banners mention a variety of topics including bribery, an affair and more. The number on the banner is not real and goes to a business in California. Carmack is currently on trial, accused of essentially stealing city property along with the city's riverfront that he later sold for a $1 million profit. He faces up to 20 years in prison. Carmack denies the charges. Last November, Carmack played video on a truck driving around Detroit City hall that allegedly showed Duggan driving to Wixom where another woman also lived. Duggan released a joint statement with his wife, saying, in part that they are proud of their 32-year marriage and want to spend the rest of their lives together. "When you elect a public official, you have every right to pass judgment on their performance in office," the statement said. "But you don't get the right to pry into their personal lives, or demand information on their marriage. At least that's how we feel and why we don't answer questions about ours." 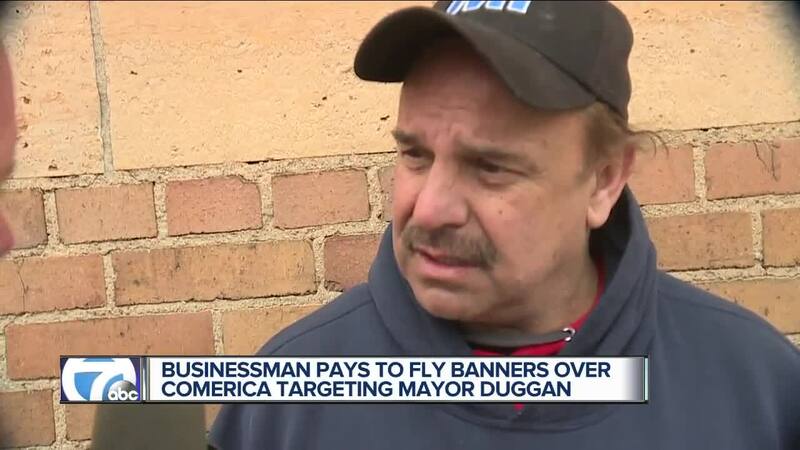 Carmack told 7 Action News that Duggan started the feud and that his banners were in response to the mayor making their personal. He said he paid $4,500 to fly the banners for six hours. A spokesman for Duggan tells us that this is what they've come to expect from Carmack. He'll be back in court next week facing four felony fraud charges stemming from the alleged theft of city property.